Another sweet performance here from the GOAT has he booked his place in his 5th Indian Wells defeating Alexandr Dolgopolov 6-3 6-1. In a match that lasted just over an hour it was complete one way traffic as Roger outclassed the Ukrainian in every department. Dolgpolov has been in fine fettle this week defeating Nadal and Raonic to make his first M1000 semi final but today his game misfired. Windy conditions seemed to play on his mind and he made far too many errors to ever get a look in. With Dolgopolov winning the toss and electing to receive I had my suspicions this one would be over quickly. Why would a below average returner elect to let the best front runner in the game get himself into lead? It shows a real lack of belief. Roger held his opening service game to 15 and was already finding the spots on serve before Dolgopolov had his first encounter with danger dropping to love 30 at 1-2. He went onto hold but finally came unstuck at 3-4 with a succession of wild forehands. The wind was wreaking havoc on the Dog's game as he struggled to make even routine shots. Looking at his box and the sky continually as the errors flowed from his racquet. As always though it is all in the mind and the conditions are the same for both players. It effected Roger too as he struggled to time his backhand but he just got on with it serving out the set to 15 to take it 6-3. It was a clean set from the Swiss who hit 8 winners to 8 unforced errors, serving 6 aces and made 71% of his first serves. The only real test he faced was deuce at 3 all but 2 big serves got him out of trouble. With Dolgopolov looking increasingly frustrated it didn't get any easier for him at the start of the 2nd set as he got broken immediately. Sick return from Roger here on break point to put one foot into the final. 2 easy holds from Roger followed and then we had the longest game of the match which lasted around 9 minutes and contained 7 deuces. We also got to see an insane get + passing shot from Fed before he finally converted his 5th break point of the game to lead 4-1. 4-1 was soon 5-1 and Roger then broke to love to close it out 6-3 6-1. Routinerer. Hard to analyse this one as Roger was too good in all areas. Dolgopolov had a bit of a nightmare to be honest and the wind + the occasion completely put him off his game. I think the matchup was clear too and it's one that works in Roger's favour. I asked myself before the match in what areas could Dolgo hurt Roger? He's not a great returner, isn't going to grind and doesn't have a standout weapon. Those things just don't cut the mustard against Fed. He is able to neutralise Dolgopolov's game completely and make him miss by forcing him to go for too much and try outlandish shots. Dolgo is also in the Monfils league when it comes to tennis brains and court sense as he just plays one way and never adjusts. Fed plays instinctively but can win matches in multiple ways, these guys just smack it and see what happens. Case in point when the wind was swirling the ball all over the place and Dolgo still tries to smash an overhead at 150 miles an hour. It was an accident waiting to happen. So I expected a bit more from Dolgopolov considering he beat Nadal but Fed just knows how to play these guys. He handles them and the conditions with ease. As for the tennis on Roger's side of the net he was just solid. Came up with the goods in all his service games and didn't face a single break point. Despite the wind and Dolgo's flamboyant groundstrokes he hit cleanly off both wings to move into his 116th career final. A good days work. So we got a Djokerer final on our hands here after Novak took care of big serving John Isner. It was hardly vintage from Novak who got broken twice when trying to serve it out before losing the second set on a tie break. He's looking sloppy but he's still winning which is the main thing. On the flip side after not winning a title pre Indian Wells for the first time since 2006 he is bound to be hungry to kickstart his season. I figure he will be right up for this and especially keen to avenge his loss in Dubai. So can Fed beat Djoker twice on the bounce? It kinda feels like it shouldn't be possible based on results over last ~3 years but the way Roger has been playing since in Dubai and at Indian Wells I think it is. Fed beat Novak back to back in 2012 at Wimbledon and Cincy so I see no reason why he can't do it here. He has got way more determination on court compared to last year and the willingness to dig deep to get the win whether it's with silky forehands or running from corner to corner. Novak has the edge in Indian Wells winning their sole encounter in the 2011 semi final 6-3 3-6 6-2 before defeating Nadal in the final so this one is real tough to pick an outright winner from. Current form – you say Fed. But Djoker is in his prime right now and edges the H2H over the last 2 years. I think we'll definitely get a good final with both guys keen to lift the trophy it's just going to be about who plays better on the day. No real secrets on the court between these two and it's a good matchup for both guys. As for where the match will be won and lost Djoker's gonna have to defend well whilst staying offensive whereas Roger needs to keep him off balance by mixing it up before pulling the trigger on the forehand. The Federer serve is of course going to be key too and with Djoker's return he will definitely have to dig himself out of some sticky situations like in Dubai. I think if he can serve clutch when he needs to then the match still lies on his racquet. I'll pick Fed in 3. 6-4 4-6 6-4. Too many errors from Dolgopolov and Roger was just too solid. Better in all areas. Yes, first, but while you were constantly clicking on the refresh button, to see if the new post was out already, I was already seriously asleep and commenting on this post in my dreams! as always awesome recap Jonathan! missed the match! T_T just watched the replay a few mins ago and WOOOW!!! was he clinical! handled the wind perfectly!! the Dog had no answers for fed and the wind! good job for fed! playing more confidently and aggressively. Djokovic just won his match against Isner! tom match wood be a cracker. I think our guy is playing better than Djoker but we have to wait and see! I’m wishing roger the best! 🙂 Already having an awesome season! hope he keeps this up for the rest of the year! Yeah I think Fed is playing better than Djok too. But I think he can raise his level for the final, needs to get a title on the board. Yeah gotta serve well and be aggressive! Thought we might be in for a 3 setter before the start of the game but obviously Roger had other ideas, and I think the occasion got to the Dog. Some lovely shots from Fed and he seems more than happy to run for balls he may not have tried for last year. Roger seems so much calmer on court and way more patient and just seems to be happy to dig in and wait for his opportunities – would like to see him try and take a few more of his break points – but to see him play like this is lovely Hopefully tomorrow we will see Roger come out on top again. I think he’s been pretty good on the break points since Dubai. Not really let any breaks slip other than maybe 1 vs. Anderson but he was serving big. Really excellent play in the wind from Fed, any player knows how hard it is to play in those conditions. Fed handled that callenge well and it was his only challenge because I like you Jon was a bit disapointed of the Dog! Maybe it was combined thing of the Wind, first time in a Master semi etc. But hé never really showed up. Now Djokovic, I believe Roger Can pull it of, it’s like he’s beginning to have this aura about him again, and his confidence is high. But it’s gonna be a tough battle. Well…. first went my Roger/Dimi-final. And now….. there goes my Roger/Isner-final. Hi Katyani…..!!!! 🙂 I really hope you are right. Don’t they say 3rd time lucky. Fingers crossed. Like you said ‘ Gooooooo Rogeeeeeeeerrrrrrrr!!!!!!! Great review Jonathan, and pretty fast too, (only 3 hours after the match, maybe everybody got the influence from Roger, fast). I kinda think that Dolgo’s way of playing is very comfortable for Roger. Fast, but Roger knows how to deal with it. They finished in 1 hour in this very slow court (don’t compare it with Nole vs Isner match, even the 2nd set is longer than Fed vs Dolgo match). And as Jonathan mentioned, Dolgo didn’t consider the wind at all, he just want to hit the ball (maybe that’s the way he beat Nadal, but Roger ain’t no Nadal). Never saw Dolgo played before, but he seems like in hurry, even the toss serve is like in hurry. Looking at 2nd semifinal, don’t you think that Novak will be tired after the match with Isner? Hmm I guess he was on court a while but I don’t think Djoker is over-tennised. Doubt fatigue is a factor. 1.) Great match, so solid from Roger. There’s nothing more to say. Great recap as usual. Your posts are just perfects, we can see how much you love tennis and of course Fed. I became so addicted to your blog that i don’t miss any comment. As for the final is gonna always be tricky, you can never write Djokovic off. But still, from what I’ve seen from his match against Isner, I won’t bet on him. He seems lacking confidence and shaky. Anyway, I have good feeling like Katyani, IW 2014 title is wating for Federer. Allez Roger ! Hey Anna, I really believe that Roger will win. This is not Roger 2013 anymore. This one has confidence and is loving playing the game more than last year. But…. one thing that does worry me is that after Novak beat Isner, he gave a short interview on court. There he was asked about the final. He really described the way Roger is winning right now (opening the court and then playing aggressive). So that got me worried. What if Novak is already anticipating all that? You know it won’t matter that Novak played longer and is more tired. He bounces back quickly. Hope Roger watched the match and will see this as a new opportunity. Not to underestimate Novak and to know that Novak is coming prepared. He really perfectly described how he thinks Roger will play tomorrow. @Katyani, of course Novak is anticipating Roger playing aggressively and trying to open the court. It’s happened in every one their 32 meetings. If he wasn’t expecting then I’d be more worried. My heart was growing as I read your prediction. Hi Tilas…… I am surprised that you didn’t get first post. Haven’t you won 46 clay court titles posts????? Haha thanks. Yeah I gotta pick Fed here. I think it will be close and Djoker is favourite with the bookies but Fed is more than capable. Really though, it’s seems that Djokovic has more to lose tomorrow (losing to an “old man” again is not going to look good for him :lol:) so I expect to him do everything to win. Anyways, regardless of the outcome this week has been a successful for Roger, here’s to hoping that he can top it off by capturing the grand prize. And I also agree with you when you say that it’s been a good week lose or win… And he’s back at 5 in the ranking so it’s a good operation already. Victory would be a bonus!!! Yeah I think Djoker has more pressure on him too! I wasn’t able to watch this one but I knew where to go to get a solid recap! Thanks again for the work you put into your blog. Looking forward to your “shot of the match”, although it sounds like there were a couple so maybe hard to choose just one? Anyway, can’t wait for tomorrow’s final, that one I WILL be watching! Yeah final is 9pm for me so peRFect timing. Felt like Dolgo kinda beat himself, Roger was just so steady. As you say Jonathan, Dolgo just doesn’t have the experience in the wind, & Roger was able to use that to his advantage. Love that we still got to see a couple of awesome gets – the one point you mentioned in the long game to go up a 2nd break, though it didn’t directly result in the break, kept him in the game to try again, & had me smiling & shaking my head. Like you I hope for a good match tomorrow, though I’m a bit surprised you haven’t predicted at least one tiebreak! 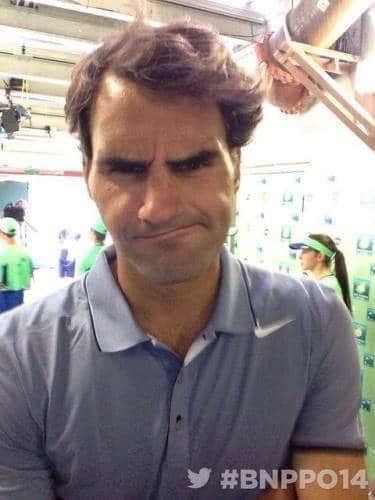 Like Roger said in one of his interviews, I’m a little surprised to see things clicking for him so well so soon – but I’m still hoping for them to click like mad tomorrow. Allez Roger! Yeah I think Djoker is a slight favourite but no reason why Fed can’t win here again. Super recap, Jonathan, many thanks! I can resonate with some of your observations – his calmness. If Roger stays calm tomorrow, be it ahead or behind, he will be more likely to serve well, the rest will follow. I feel that he will take Nole out tomorrow. Nole does not appear to be confident at all in the semi. If Roger has a bit of luck, I feel that he could win in two straight sets! Allez Roger! It was a weird match from Djoker but he did manage to breadstick Isner in the third. That is quite convincing in the end despite him having a shocker at 5-4 6-5 in second set. Roger has really put on a clinic the last few matches, what a fun time for Fedfans huh, silencing the Nadal fans who said Dolgo was the favourite against Fed? His serve all week as been just as impressive as his mentality. I don’t know if anyone else watched the Isner/Djokovic match but it was pretty painful to be quite honest, Novak is looking vulnerable and Fed looks to be beaming with confidence. Sometimes it can just come down to the day so if Roger is to keep this run going, that serve is primary- he’s never lost in a final at this tournament and has a change to get back into the top 4 so he has the edge. I think whoever wins the first set wins the match. Fingers crossed, c’mon Roger! I saw the second set onwards. If Isner had won the game at 5-4 in the first then he probably would have won. Breadsticking Isner in third though was quite good from Djoker. Maybe he has played himself into form but not sure. Great post! Roger was clinical and tactically sound, he did not try too much under the windy conditions. A minor blip on some risky shots but otherwise it was a good match. He mixed up his shots and dial in his groundies. I hope he continues to serve well against Djoker as it would be key for him. Go Roger!!! First serve and clutch serve hugely important if he is to win vs. Djoker. I was a bit nervous before the Dubai final, but predicted a win for Federer. This time I’m not nervous at all. 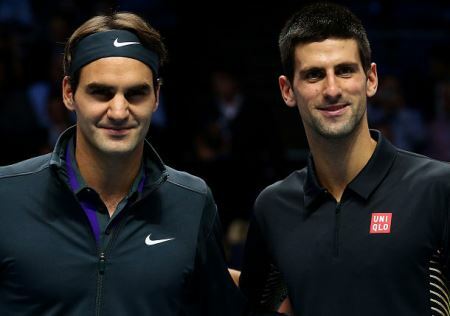 Federer has already shown that he can again beat everybody except Nadal, and matches between him and Djokovic are always exciting. Djokovic needs to win this one more than Federer. 7:6, 4:6, 7:5 win for Roger! I am with you Chris on this, Roger has already shown and proven he can beat anyone except Nadal. but I still have to give the edge to Novak this time because I believe Novak needed it the most. Roger’s need is greater IMO; he needs to be back where he belongs – top 4! Nole will get a title as the season rolls on and might not cry into sleep without one, however unusual to him. In particular, Roger needs to keep his momentum going to deep root his confidence in order to challenge for a title at RG. IMO, Nole’s current state is a norm, as he had a purple patch of 2011, which was not a norm to him. He is very good on HC (with 5 GS titles) but not as good as Roger (with 9 GS titles). True, today’s match is just one match. I just feel that Rog will bring Nole down. Allez Rog! I don’t feel as you can compare their HC GS titles yet. Djoker is still in his prime, he may and probably will gain more (not necessarily more than Rog, but it’s possible). Simon, agreed, I might have slightly over-stretched it earlier by quoting their GS stats. Nevertheless, looking at other stats (on HC) in the Roger-Nole rivalry also indicates in Roger’s favour: 14-12 on HC overall and 4-2 IW tiitle. Again, the only meeting they had at the IW was in 2011, when Nole nearly cleaned the field (once in the life time). Look at their current forms: Roger in the rolling-back-the-clock form whereas Nole is just average in every standard. I watched their last year’s Paris Master and Master Cup matches; Roger just looked tired with little confidence and could not defend as well as he normally does. Now he plays so well, especially his defence and confidence. If Roger serves above 65%, he will beat Nole. Komm Jetzt Rog! I think Djoker needs to win more than Fed. More pressure on him, he is favourite going in and needs to get a title under his belt. Roger Federer is now at a lock to pass Lendl on the list of most consecutive weeks in top 10, he has collected 2000 points YTD, if he wins IW it will be around 2400 – normally, with 3000 points a player is in the top 10, so as a minimum he is top 10 for probably 40-50 weeks from now, even with poor results. So Roger moves to seconds place on that list. He is 3,5 Calendar years from Conners, though…. That is a lot, so only doable if he really stays injuryfree, and also he’d have to play until he is 36, he might retire before getting this record! Cheers for the stats, I had no idea about that record. There are so many he has either got already or on the verge of. Connors looks a tough task, that guy played forever. The two highest spots ofi the “Emirates ATP Race for London” are now occupied by two Swiiss players: Stanislas Wawrinka and Roger Federer. If Roger wins IW, he’ll become the frontrunner. Another super quick flawless recap, Jonathan, just as our GOAT’s performance yesterday. You wouldn’t tell it’s windy from Fed’s play except his hair blowing in the air, especially looking at his service games, would you? He is a such a great player in windy condition. I still remember the match against Soderling US Open 2010, omg everybody was blown away that day except Roger. Anyone who drinks Coca Cola at changeovers is good for the sport. Great to see Roger still on a roll. I hope he can keep it up for tonight. It’s difficult to know what went wrong for Dolgopolov. The occasion? The wind? Or was Roger just too good for him? I sometimes tend to forget that Roger at his best tends to make everything look easy when it isn’t. Makes you realise just how far behind most of the others are really. Looking forward to today/tonight’s match anyway. I wouldn’t like to predict a winner. Djokovic is looking shaky as others have said, but on the other hand he really needs a title now I think. Roger, on the other hand, is quite relaxed, has done better than he thought he would so far this year, and probably won’t mind too much if Novak takes the title. Just hope for a good match – if possible with Roger to win of course. Djoker is favourite I think if you are betting but Fed definitely has a good shot. I would never, ever, ever bet against Roger! What a thought! Hey Jonathan, you are doing a great job keeping up with a victory a day from the Goat! Clinical win, clinical write up! Remember saying last year that it was all about the serve as to what Fed needed to get back! Well he has truly delivered and I believe he can win today if those service numbers hold up! Make no mistake Novak is out to prove people wrong, Marion Vaidja back in his corner , (BB out for a while) but Fed is growing in confidence every day and the Dubai match will be in both their minds! If it is windy , Fed in 2, otherwise in 3! Allez Roger! Yeah where has Becker gone? To get some coaching badges? lol. Not since 1986 have I witnessed a Ukrainian meltdown of such epic proportions. In something of a non-event the testing material for Roger never materialised. Dolgopolov was in blistering form before meeting the Swiss but became a tragic victim of the elements. Mother Nature obviously hates Ukrainians. First Chernobyl and now she conspired to rob this enigmatic player from popping the cherry on his virgin ATP1000 final. If I’d bought tickets to the Indian Wells semi-final I’d have been slightly miffed and probably demanded a refund. It’s a good thing I live in Vietnam I guess. The blustering hurricane that descended on the court made it less a test of skill and athleticism than a test of who could hit the safer moonballs. And with an Isner match as the next feature it was guaranteed that no tennis would come to pass that evening. This was a mockery of sport of tennis. It was a particularly galling (or is that gale-ing?) set of circumstances for the Ukrainian as he employs a strategy of clean flat strikes that leave little margin for error. The slightest deviation in his contact point with the ball means it goes from being a potential 100kph ripped screaming winner to taking out a woman’s eye in the third row. As they say a butterfly can flap its wings in Tokyo and cause a raft of errors to flow in Indian Wells. The Ukrainian only managed 40% of first serves in in perfectly still conditions against Nadal so he wasn’t finding his mark too often in yesterday’s twister. Couple that with the strategic nous of a retarded chimp (“If in doubt hit harder”) and that left him with little hope in yesterday’s blizzard. Fair credit to Federer he did what he does best: allow stronger hitters to hang themselves. And the conditions played into his hands. He found the perfect storm. All he had to do was serve decently and allow Dolgopolov to shoot himself in the foot. In a country famous for mail order brides maybe it’s fitting that Alexandr got send packing by Fed Express. Speaking of post does anyone think Roger needs to send a little thank you note to Nadal for tiring Dolgopolov out? Apparently the guy has Gilbert’s Syndrome which means he can’t go too many matches without hospitalisation. Little typo discovered: you wrote Troy Nguyen instead of Troll Nguyen! Nevermind, your style is unique! I think that Roger should not only thank Nadal for tiring Dolgo, but also Putin, for invading Crimea to make Dolgo lose focus. And the referee was also guilty, for all the wrong line calls against Dolgo. It’s a conspiracy against the Ukrainian would-be GOAT! Troy, I wish that at the semi the guy at the other side of net were Nadal. OK, Nadal beat Roger a couple of times on HC and has given Roger a few problems in the past. Every match and tourney is different. Roger beat Nadal at IW before, though lost to him last year. The fact that Nadal could not even overcome Dolgo, who was your world beater, suggests that had he progressed, Roger could beat him with no sweat. The windy and sunny conditions were the same to both players. Blaming that sounds a lame execuse. Making adjustments, playing outdoors, are substantial part of the game and ‘talent’, which Roger has tons whereas Dolgo has just onces. Dolgo has had a veery good week, which he should be proud, but he is not a world beater, not yet, especially in front of Roger. Roger had poor matches last year, surely you noticed, but that was not the normal. Roger just does not get beaten by any player, otherwlise, how could he collect 17 slams, 6 master cups, 21 masters and 302 weeks in No 1? Roger is the GOAT, others like Nadal and Nole might be great champions and legends but they are not GOAT!! Touting Dolgo in front of Roger was a bit of joke, I admire Troy’s sense of humour. Mr Nguyen, all I have to say is this: Roger Des-Troyed your Dog! Not really sure what you are on about with the comment on disasters, and mail order brides? Car crash. Come on folks, chime in! Random point- Did any one notice Federer signing on the camera with his left hand after his match against Anderson or Haas (I think Haas). I thought maybe it was the camera playing tricks, and so made sure I checked his next two matches. Signed with the right in those. Ambidextrous? Tennis GOAT. Multi linguist. Now Ambidextrous. Is there anything the guy can’t do!!? I hadn’t noticed. Anyone got a clip?! Gaurav, i believe it is a mirror feature on the camera. They sometimes flip it but not all the times. To check it, if Roger sign it with right hand, from our side the signature is flip, but when you see Roger (look like) sign it with left hand, we can read roger signature correctly. Start the match already! I wants me a Masters 1000, now! I’m feeling that way too Sid. How many hours is it now? Yes. Let’s go out and dance together if he wins! Yes, I’m proud of him too Katyani. He’s had a great tournament,much better than I expected and I think better than he expected (perhaps largely due to early exits of some). Good to see in his presser that he seemed quite happy about things and happy with his play. Also in the ceremony after the match where you can see players immediate reactions he didn’t look too down about it. well fed had the mach in his hand but tried to make it out in baseline slugfest. He deserves some spanking from edberg SO STUBBORN. Ah Dhruv… not fair….. Roger played a great tour and match, much more than the others, much better than the others…. just too bad he lost the TB…. katyani,i am happy that roger reached semi final and more in every tournament since us open.but today he played like jesus fed in set 1 but also novak was not able to hit DTL backhand.but in set 2 he should have come to the net more often.Just to mix things up. But again he made the finals which is a big thing and climbed the ranking. And most probably be world no 4 if he does not pull out of miami. Posted a reply to this – in the wrong place 🙁 About six posts up if you’re interested. Losing 2 points on serve in the TB with great clutch serving by Djoker made the difference. Overall a great tournament for Roger. Slow or not, I hope he plays Miami and keeps moving up the rankings and confidence. This ‘#meloveyoulongtime’ really means a lot to me and I hope it means a lot to you all as RF Fans. Let’s keep rooting for this guy! I feel there will be great victories this year…I know. Stay positive! Is the draw for Miami out yet ? Am I the only who feels like Roger’s gone back to last years play style? Have not seen him come to the net AT ALL this week… Maybe because of slow court? Simon, do you know what time the Davis Cup matches actually start. 1.30 it says on the site, but I assume there will be some opening ceremony, national anthems and all that first? I’m going with my son but he has school until 4 pm and that’s all the way over in Onex so I reckon it will be 4.30 at least before he joins me. I’m hoping he will just miss one match. In the meantime I will have to defend an empty seat! I am a little disappointed that Federer couldn’t win. But still happy that Fed made the Final and gained points. As long as Kneedal doesn’t win I am happy. Even though I don’t like the Djoker as that much I don’t mind him winning than Nadal. Anyone else than the moonballing, hit to the BH and then down the line Nadal !!!!! Zzzzzz boring boring same style of play. Novak is now what closer to regaining number 1 back. Rather have him nr 1 than Rafa. After USO 2013 Roger made every SF and more in each tour he entered (maybe with the exception of 1?). Was a little surprised at that result as I thought Fed was going to win. Had watched them both over course of the week. Djok was nowhere near his best, Fed was playing as well as we could expect at this stage of his career. Djok was dropping sets each round in the easier half of the draw by a country mile. Fed avoided the 3 big guns in his half due to them losing, but he still had to beat these young guys who did all the damage and he handled them all comfortably. I also felt because Djok was taken to 3 sets v Isner and Fed already had his semi out of the way in 2 sets, he might just be the fresher player. Biggest turning point was Fed losing the first point on his own serve here. Djok held both his serves to lead 3-0, and he was looking very solid, the demons must have set into Fed’s head there, and that proved too big a lead to pull it back. Had Fed held his own serve and gone 1-0 up, it might have made all the difference to the end result. Disappointing but still could not have imagined from last year, Fed getting back to this high level. What he has to work on is the mental side of his game, to get him over the line in situations like last night (as he used time and time again during his glory years) and also must get over the crazy Nadal hoodoo. Whenever they meet you just know 95% he is going to lose, yet if Nadal gets beat in a tournament, Fed is more than capable of beating any guy who beats Nadal, that is plain daft that this should be the case. Fed should be able to work on a strategy to beat Nadal same as anyone else. Novak lost his doubles the first match and with exception of one match, he played all of them 3 sets. OUR ROGER played the doubles all the way to the SF and won ALL his singles in straights…. yet…. Novak is the one walking away as the winner……..
Dear friends, Federer dropped this for his fans on his twitter page today #meloveyoulongtime…that melted my heart. hope we all keep that very dear to us. In the meantime, I vote anyone who predicts against Roger no matter how the match or H2H is should be kicked out. My first grouse goes to Jonathan for saying right at the beginning before this tourney started that Djokovic will win this, smh! I’m not sure if Fed will play Miami, I am hoping he does so he has a cushion to fall back on and defend his points for Rome. Oh, which reminds me Utch…. I did say Novak was not going to win IW 2014…. i predict Roger to win the French, Wimby and US Open! And Katyani, you are right! Djoker is really closer to competing for the No 1 ranking now. Nadal is loosing points big time. Federer is flying to Miami :), I think it will depend on the draw, if it looks too stressful like Indian Wells, he will just pull out. I saw that too Rita, thought it was very well put. Roger’s got a good draw for Miami. Hope he plays. Bye in the first and Ivo in 2nd. Followed by Verdasco, KA, Ferrer/Dimitrov. SF against Murray/Djoker.